A game crashed on my gear vr and now I can't access my galaxy s7 phone how do I fix it? Galaxy s7 gear vr issues. Gear VR Controller, Unity VR Samples Tutorial Problem. No longer able to download movies ...? dirty between the lenses - how to clean? Has anyone had success converting 2D to 3D/and or VR, any good programmes for this? [GearVR] How to make zoom-in option in UE4? 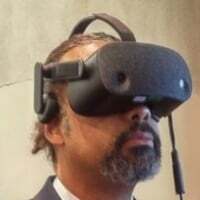 Is there any way to show my VR experience on an external monitor from my Samsung Galaxy VR?? ?